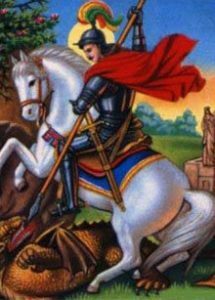 St. George (Geevarghese Sahada) was born in Cappadocia, in a noble Christian family. It is believed that when his father died, he moved to Palestine, his mother’s country of origin. He held an important post in the Roman army – the rank of tribune, or perhaps colonel in modern terms – during the reign of the Emperor Diocletian (AD 245-313). Dioclesian was a great persecutor of Christians (from about 302 AD) and when the persecutions began George put aside his office and complained personally to the Emperor about the harshness of his decrees and the cruelties against Christians. He was thrown into prison and tortured. But he declined to recant his faith and the following day he was dragged through the streets and beheaded. He was martyred at Lydda in Palestine (AD 304). The Emperor’s wife, Alexandria was so impressed at the Saint’s courage that she became a Christian. So she too was put to death. One of the greatest legends about Saint George is the Golden Legend. In it, a dragon lived in a lake near Silena, Libya. Many people and even armies had gone up against this fierce creature, but failed. Villagers used to pacify the monster by giving sheep to it. When mutton was scarce, lots were drawn in local villages, and maidens were substituted for sheep. Saint George reached this village on a day, when a princess was to be eaten. He rode on his horse to battle against the serpent, and killed it with a single blow of his lance. St. George then held forth with a magnificent sermon, and converted the locals. He was given a large reward by the king, but he distributed it to the poor and rode away. Due to his chivalrous behavior (protecting women, fighting evil, dependence on faith and might of arms, largesse to the poor), his intercession is sought against demons, evils and enemies.